Deep Creek Hot Springs is one of my favorite places to visit. The drive is a little further from Orange County than my usual day hikes, but the hot springs are definitely worth the extra time in the car. The springs are located at the bottom of a remote desert canyon. They flow directly from the ground to fill 4 steaming hot pools that spill over into an emerald green river. You can actually soak in the hot springs and then take a swim in the calm bend of the river. I highly recommend visiting them in the middle of the week because I’ve heard that the rowdy locals come out on the weekends. The hike to the hot springs is an easy hike on the way in because you’re headed down into the river valley. After soaking for several hours in the 100+ degree springs, your legs are going to feel like jelly on the way back out. The elevation gain coming out of the canyon is definitely a factor to be considered for young children. Be warned,the hot springs are clothing optional. Of the ten or so people who were at the hot springs last time I visited, 3 of them were naked as the day they were born. There is also a river to forge. When its running high, you will definitely get wet. The last time I visited, nearly everyone at the hot springs was drinking alcohol. You may just want to leave the kiddies at home for this trip. The parking lot most people use is located on private property at Bowen Ranch. The owner collects the fee. Last year, the fees were 5$ per person/per day, or 10$ per person for overnight. I have never been able to ascertain exactly who owns the hot springs themselves, but most maps put them in a state forest. 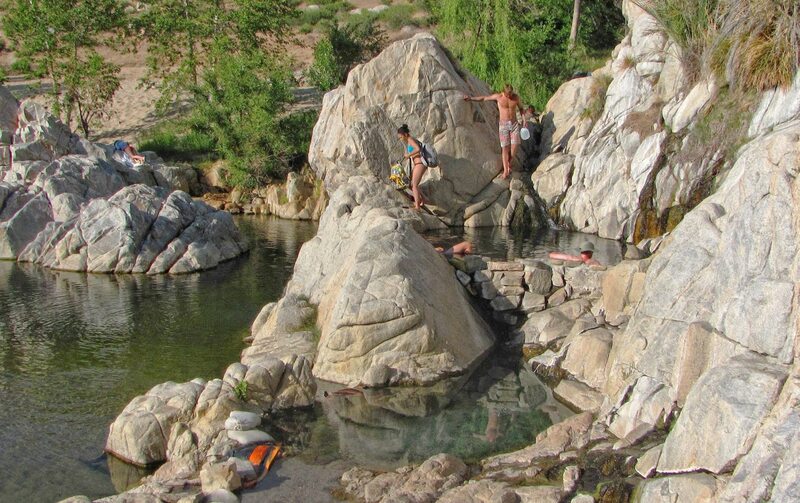 The hot springs are located about an hour north of Rancho Cucamonga in Apple Valley California. Google maps and your GPS are basically useless for finding Bowen Ranch, so you want to have someone navigating in the car for the last 15 miles or you’ll probably miss your turn. From Route 15, take the Bear Valley Road exit and head east. After approximately 7 miles, turn right onto Kiowa Road. It’s easy to miss it. After 3 miles, turn left on Roundup Way. After 4 miles, take your final right onto Bowen Ranch Road and follow it all the way to the end until you hit the parking and fee area. Bowen Ranch Road is unpaved, but well maintained and generally free from potholes and ruts. The owner at Bowen Ranch collects the fee in the parking area. He will also give you a map and directions for the trail. I was glad I listened to him because the trail was a bit confusing. The owner is VERY specific about packing out your trash. He has to make several trips a week to clean up the Bud Light bottles and Skittles wrappers people leave behind. I can't imagine the deplorable shape the hot springs would be in without his dedication.